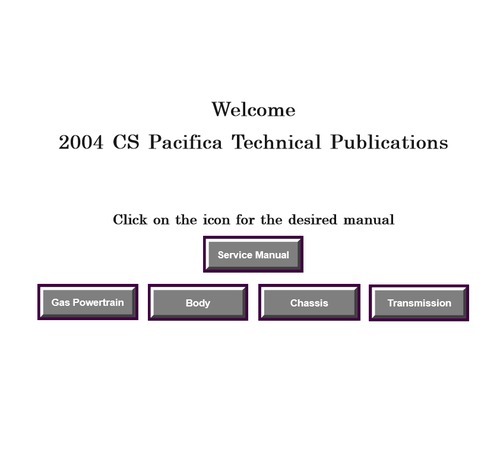 Chrysler CS Pacifica 2004 Service Repair Manual. Chrysler CS Pacifica 2004 Service Repair Manual,Chrysler CS Pacifica 2004 Service Manual Repair. This is a complete Service Repair Manual ! It contains information and detalis you need to help you not only fix your vehicle problems, but also maintain your vehicle good functioning for future use ! This manual is also a very reliable source of information that will make you, in time know more and more about your vehicle and how to prevent future problems from happening !! This service manual is specifically written for the do-it-yourselfer as well as the experienced mechanic. Using this repair manual is an inexpensive way to keep your vehicle working properly. Each manual provides step-by-step instructions based on the complete disassembly of the machine. It is this level of detail, along with hundreds of photos and illustrations, that guide the reader through each service and repair procedure. Simply print out the pages you need or print the entire manual as a whole. This file is sold by dobby, an independent seller on Tradebit.